24/7 is a full evening in the theatre. Bang. That’s true. And the main reason is this super crew — some brand new, some have been designing with 24/7 since the beginning. 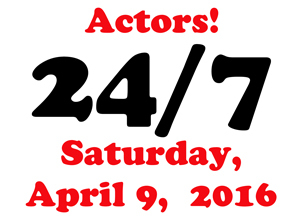 Costumes, Lights, Sound, Set, Props, Running Crew, Stage Management, and everyone is on their game that day. 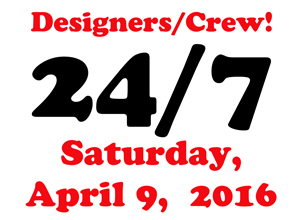 The designers have about 3 hours to design 7 shows before tech rehearsals begin. Come see what these freaks of talent can do. I think there’s a sign outside of 24/7 this year that reads, “you must be THIS TALENTED to ride this ride.” Because — look at this list of actors — I would cast any of these over-talented clowns in anything. And, I guess that makes sense. Here they are, throwing their hats in the ring to be cast in, well… just about anything. And, yes, they’re all freakishly tall… I mean, talented. Plus, are there a few surprises up our sleeves? Maybe. January 23rd @ LIVE ARTS. Get your tickets now: HERE. 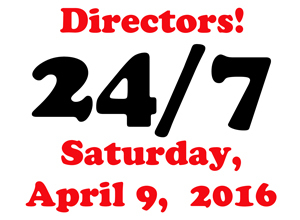 Where do all these great directors come from? It’s a riddle wrapped up in an enigma wrapped in bacon. 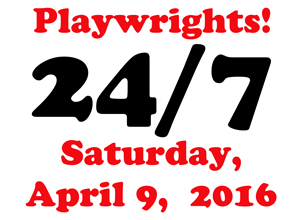 If you would like to walk into a theatre at 7am, see a stack of freshly written plays — written by a now exhausted and strung-out playwrights — pull one at random and be told, “Here, make this work!” Then the job of Director for 24/7 is the perfect job for you. Get your tickets now: HERE. If every year we say we have the best playwrights ever, but each year they’re different playwrights, you might ask, how does that work? A. Each year the playwrights do indeed get better. B. Each year we all get better. C. Everything you read on the internet is a lie. You’ll have to come see the shows on April 9th to find out (buy tickets here).